Home » » Father-of-3 Was Flung Away in Horrific 'Hit and Run' Crash. Father-of-3 Was Flung Away in Horrific 'Hit and Run' Crash. A video has emerged showing the moment a man identified as Andy Payne, was flung away by a car in a horror crash. According to The Sun UK, the hit-and-run driver who ploughed into the dad-of-three in a horror smash caught on CCTV is now facing jail after today admitting being behind the wheel. 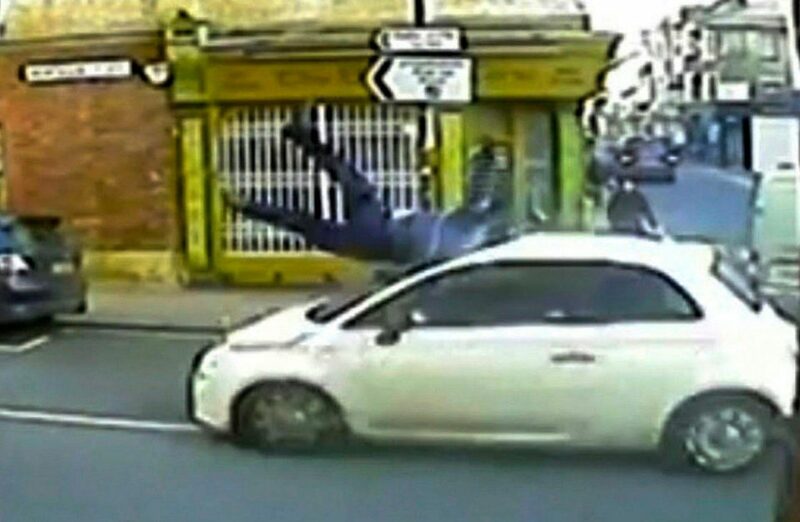 The shocking footage shows Adam McDermott on the wrong side of the road when he tossed Andy Payne 15ft up in the air and he ended up 35ft down the street. The 32-year-old left him for dead speeding off with a smashed windscreen unable to see where he was going for a mile. He then torched his girlfriend Robyn Burns’ Fiat 500 he’d been driving in a botched bid to destroy the evidence. 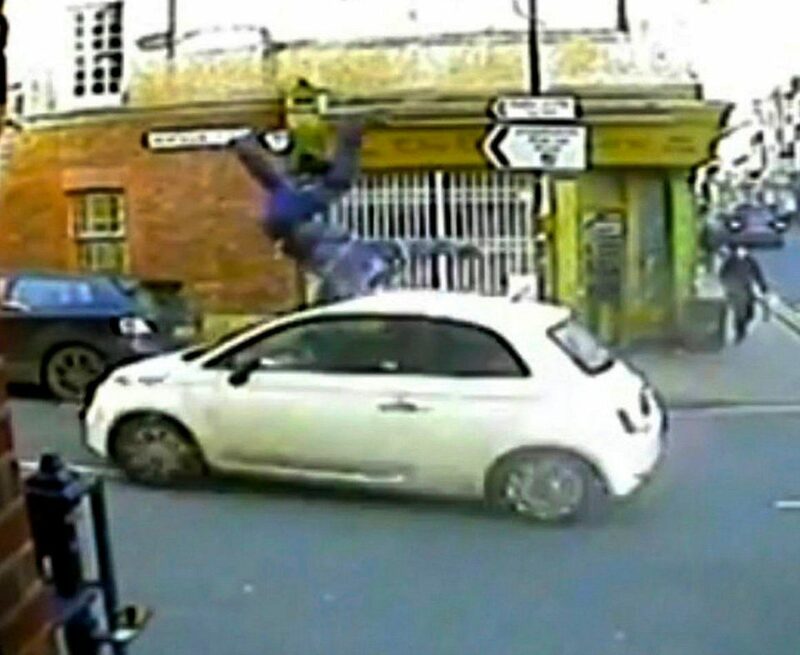 The horror video of the smash – released by cops to catch the driver – was viewed over three million times on YouTube. Lucky-to-be alive Andy, 53, suffered a bleed on the brain and was rushed to hospital with life-threatening injuries. He has been left with memory loss and cops said it was miraculous he didn’t die. McDermott and Burns were set to go on trial today after the crash in Brighton, East Sussex last January. But he admitted causing serious injury by dangerous driving at Lewes crown court as Andy and his wife Lisa sat in the public gallery. The out-of-work builder also pleaded guilty to perverting the course of justice with another man, Clark Walker, by buying lighter fluid to set fire to the car. The half burnt out car was found just two streets away from the house McDermott shared with his mother and fiancee. McDermott has a six-month-old child with Burns, 29, who broke down in the dock as she pleaded guilty to perverting the course of public justice. She and McDermott told police and her insurance company the Fiat had been stolen before the horrific smash. His part in the second conspiracy was left on file. He also admitted driving without a licence or insurance and failing to stop after hitting meter reader Andy, of Hove. The judge was told McDermott, of Brighton had a previous conviction for shoplifting and threatening somebody with a knife at the Lakeside shopping centre. Walker, who attempted to burn the car with McDermott, was recalled on an indefinite sentence following the arson. He had been in jail for a Samurai sword kidnapping. McDermott said "Cheers" as he was remanded in custody to be sentenced on November 17. Sgt Dan Pitcher, of East Sussex roads policing unit, said: “McDermott’s driving was dangerous and police launched a significant investigation after he tried to set light to the car. “The crash caused serious damage to the car, meaning McDermott could not see where he was going as he drove for a further mile afterwards because the windscreen was smashed. He said: “Andrew Payne sustained serious injuries as a result of the collision.